ADIT-MEDIA Mobile, Rich Media, Banner advertising network details. Adit-Media is a well-known ad network that provides online performance by working with top brands from all around the world. Their goal is to offer for their partners the best ROI and reach the highest rates in the market when it comes to publishers. Adit-Media understands the high-demand when it comes to quality and the expectations are always succeeded. They use their broad experience in analysis and optimization tools in order to link you to the right partners. The Adit-Media team is available 24/7 for any questions you have regarding their campaigns and not only. The platform also provides long-term partnerships as they are constantly working on improving relationships with customers and partners. Adit-Media thinks that if you find a good advertiser, you will not be looking for a better one. For additional information before registering on the Adit-Media platform, see the Information section. 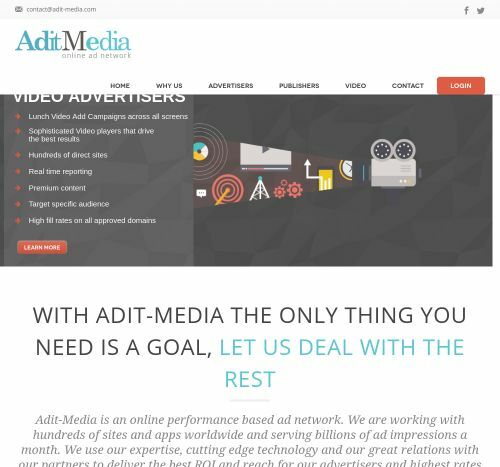 Adit-Media is an online performance-based ad network. We are working with hundreds of sites and apps worldwide and serving billions of ad impressions a month. We use our expertise, cutting-edge technology and our great relations with our partners to deliver the best ROI and reach for our advertisers and the highest rates in the market for our publishers.